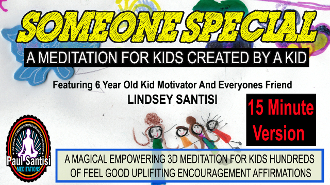 Here is a magical 3D guided meditation by "KID MOTIVATOR AND EVERYONES FRIEND" Lindsey Santisi 6 years old. Lindsey created most of the affiramations on her own. Kids from all over the world love this audio and many adults too as well. She wanted to create this audio for all kids all over the world to feel better about themselves and to know that she is their freind. Here is the audio below so you can preview it. Its in 3D sound so make sure to wear headphones.